Republicans are considering including a plank in their party platform calling for a full audit of the central bank. Prodded by the failed primary bid of longtime Fed critic Ron Paul — and the grassroots enthusiasm the Texas congressman’s cause inspired among bail-out weary Tea Party activists and small government advocates — Republicans are entertaining a prospect that has long made them and some of their financial supporters cringe. When Congress established the First Bank of the United States in 1791 at Alexander Hamilton’s recommendation, the Treasury Department was given the power to inspect the bank’s books at any time. Furthermore, while the Treasury oversaw the First Bank of the United States, the House of Representative repeatedly audited Hamilton and the Treasury Department, each time finding nothing wrong. While it is important for the Federal Reserve to be independent, just as the First Bank of the United States was independent, this powerful government-created institution needs oversight. All publicly-traded corporations are audited by CPAs and federal government agencies are audited by the General Accounting Office. The Federal Reserve should be bound by rules similar to those established for government agencies and public corporation. If we are to have a government-granted monopoly over money printing (something the Founders would have opposed), it should at least be subject to the principles of checks and balances that our Founding Fathers held so dear. A regular audit of the quasi-government agency known as the Federal Reserve is something the Founders would have supported to prevent the accumulation and misuse of power. Alexander Hamilton’s Treasury Department had oversight over the First Bank of the United States. Today’s Treasury and Congress should have similar oversight over today’s central bank, which is much more powerful than the national bank of 200 years ago. Rep. Debbie Wasserman Schultz (D-Fla.) called the tea party “tyrants” in a tweet on August 7 because its members supposedly blocked a bigger and better deal from being approved. A tyrant, as has often been repeated, has no regard to any public interest, except as conducive to his private ends; his aim is pleasure. The accumulation of all powers, legislative, executive, and judiciary, in the same hands, whether of one, a few, or many, and whether hereditary, selfappointed, or elective, may justly be pronounced the very definition of tyranny. Hmm, the tea party fits none of those definitions either. The tea party is not an absolute ruler, has not usurped the nation’s sovereignty, is not a ruler with absolute power acting oppressively or brutally, and is not an oppressive ruler acting harshly. I’d be very interested to hear by what definition the tea party are tyrants. 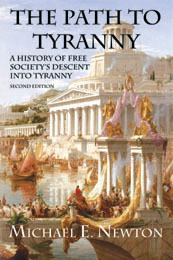 – Michael E. Newton is the author of the highly acclaimed The Path to Tyranny: A History of Free Society’s Descent into Tyranny. 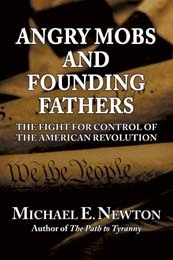 His newest book, Angry Mobs and Founding Fathers: The Fight for Control of the American Revolution, was released by Eleftheria Publishing in July. Hosni Mubarak was an autocrat who ruled over Egypt for 30 years without fair elections and no checks and balances on his power. Scott Walker is the duly elected governor of Wisconsin. He has been in power for a month and a half. He cannot enact any laws without bills first being passed by the state legislature. The comparison is laughable. But then again, these very same people have compared Scott Walker to Mussolini and Adolf Hitler. Some even say he is Mubarak and Hitler combined. Bush got things done, Obama takes credit for doing nothing. Most Americans like the new tax cut law that President Barack Obama signed into law on Friday, according to a new national poll. The poll also indicates that 55 percent of the public thinks Obama’s policies will move the country in the right direction, with just over four in ten saying the president’s policies will move the nation in the wrong direction. Obama’s 55 percent is 11 points higher than the 44 percent who say the policies of congressional Republican leaders will move the country in the right direction. Americans are split at 48 percent on whether what congressional Democrats are proposing will move the country along the right path. “Since the GOP just picked up 63 seats in the House, what’s not to like about their policies? The tax bill may be a good place to start,” says Holland. According to the poll, 56 percent of the public say that the bill does too much for wealthy Americans and six in ten don’t like extending the tax cuts for families making more than $250,000 or the changes in the estate tax. And less than one in four believe that their personal situation will improve as a result of the tax bill. Only four in ten favor an increase in the federal deficit to pay for tax cut compromise. But despite those figures, three-quarters of all Americans approve of the tax bill overall, including the extension of jobless benefits for the long term unemployed. President Bush and the Republicans were wrong to pass the tax cuts in 2001 and 2003. President Obama was right to extend them in 2010. Republicans were wrong to extend them in 2010. A good sign. Republicans get religion on earmarks. In the 2011 House budget, the groups found that House Democrats requested 18,189 earmarks, which would cost the taxpayers a total of $51.7 billion, while House Republicans requested just 241 earmarks, for a total of $1 billion. The Senate is a different story. But even though some Republicans are still seeking earmarks, Democrats are by far the bigger spenders. The watchdog groups found that Democrats requested 15,133 earmarks for 2011, for a total of $54.9 billion, while Republicans requested 5,352 earmarks, for a total of $22 billion. In the House, Democrats out-earmarked Republicans by a 50-to-1 margin. Democrats out-earmarked Republicans by a 5-to-2 margin in Senate. With Republicans taking over the House in January, we could see earmarks disappear. At least that is my hope. Yes, I know that earmarks are just a small portion of the wasteful government spending. I even heard one Democratic analyst say “Earmarks are a rounding error.” Only in Washington is $8,300,000,000 considered a rounding error. More important is that earmarks are, in effect, a bribe to get Representatives and Senators to vote for a bill they otherwise would not have voted for. If a Congressperson likes a bill, he or she should vote for it on the merits and not for the earmarks. And if he or she dislikes the bill, vote against. Thus, earmarks are either a complete waste of money if they don’t affect how our Congressperson votes or is a form of bribery if it does effect them. Earmarks are wasteful or evil. Either way, we should get rid of them forever.